In honor of Rex Ryan's first game against the Patriots as head coach of the Buffalo Bills, we figured this would be as good a time as any to look back at the very first game he was the head honcho for against New England. Let's set the scene: Sept. 20, 2009, a sunny Sunday afternoon at Giants Stadium. The Jets and Patriots both came into the game with 1-0 records. Tom Brady was playing only his second full game since returning from an ACL injury that kept him out for the entire 2008 season. The previous game was the season opener at Gillette Stadium against, ironically, the Bills. Brady marched his team down the field to score two touchdowns in the last five minutes to win that game in dramatic fashion. At this point in time, the Pats still featured the likes of Randy Moss, Wes Welker (he was inactive for this game) and Laurence Maroney as primary offensive weapons. They had signed Joey Galloway as a free agent, which gave many hope that the offense would be even better. The Jets were playing their second game under new head coach Rex Ryan, who was previously the Baltimore Ravens defensive coordinator. The world was quickly exposed to Ryan's boisterous personality, as he took to great lengths to make sure the Jets and their fans were ready for this game. There was the famous quote about him not coming to New York to "kiss Bill Belichick's rings," there was him sending phone messages to Jets season ticket holders saying he wanted them to make life miserable for Brady, and lastly, he sent out three former Patriots as his captains for the coin toss. Other Jets players such as Kerry Rhodes wanted to "embarrass" the Patriots and Kris Jenkins called it the Jets' version of the Super Bowl. The Patriots defense started off strong, recovering a fumble with about 8:45 to play in the first quarter and nearly recovered another one early in the game. They would only give up 16 points on the day and held Jets quarterback Mark Sanchez to 163 yards and one touchdown, so they did their part. The biggest problem for the Patriots was that their offense really couldn't get going at all. The Patriots got on the board in the first quarter with a field goal and lead 9-3 at halftime. The Patriots did have their chances, though. Julian Edelman missed a pass from Brady on what would have been a sure touchdown, and Moss had a chance at catching a tipped pass in the end zone with time winding down in the second quarter but he couldn't corral it in. In the end, New England's inability to get into the end zone would be their downfall. The Jets scored 13 unanswered points in the second half and their defense stood tall on every Patriots' offensive drive. 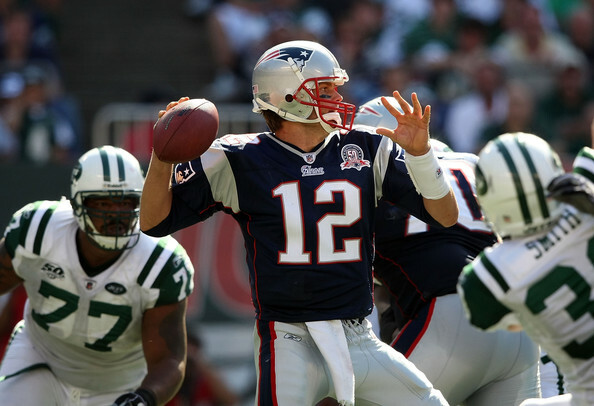 The Jets defense was unable to sack Brady, but they had the perfect game plan for him. They were able to generate pressure on him constantly, forcing him to get the ball out quicker than he wanted and miss tons of throws. Brady finished the day going 23/47 for 216 yards and an interception. It was the first time since Dec. 10, 2006 that New England was held without an offensive touchdown. Moss was blanketed by Darrelle Revis the entire game and was largely ineffective as a result. Brady threw one interception, which was a pass intended for Moss but was picked off by Revis. Brady relied heavily on a young Edelman and Galloway, which obviously didn't work out. With the Patriots driving late in the fourth quarter, they had to convert on a 4th & 10, or else the Jets would come out victorious. Brady tried to find Galloway, but the ball was batted away and the Jets would go on to win 16-9. It was a loss that was tough to swallow because all anyone heard after the fact was the Jets boasting about them beating New England and being on top of the division. Nobody wanted to lose to Ryan because of the way he acted (and still acts to a lesser extent). The Patriots would get revenge, however. The Jets came to New England on Nov. 22 and fell to the Patriots 31-14. 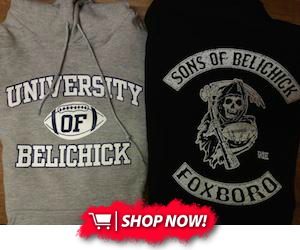 There have been many memorable match ups between Ryan and Belichick. There was the 2010-11 divisional playoff game in which the Jets won in New England, the Patriots blowout win on Monday Night Football in 2010, the 2012 game in New England that the Patriots won in overtime on a Rob Ninkovich strip sack, and the controversial overtime game in New York in 2013 in which the Patriots defense was called for a penalty that allowed the Jets to get a second attempt at kicking the game-winning field goal. Fast forward to today, and Ryan's record against Belichick stands at 4-9. The Bills look a lot like those old Jets teams due to their aggressiveness on defense and the ground-and-pound type of offense they employ. Ryan makes life really difficult for New England, and you can probably expect that to continue on Sunday.